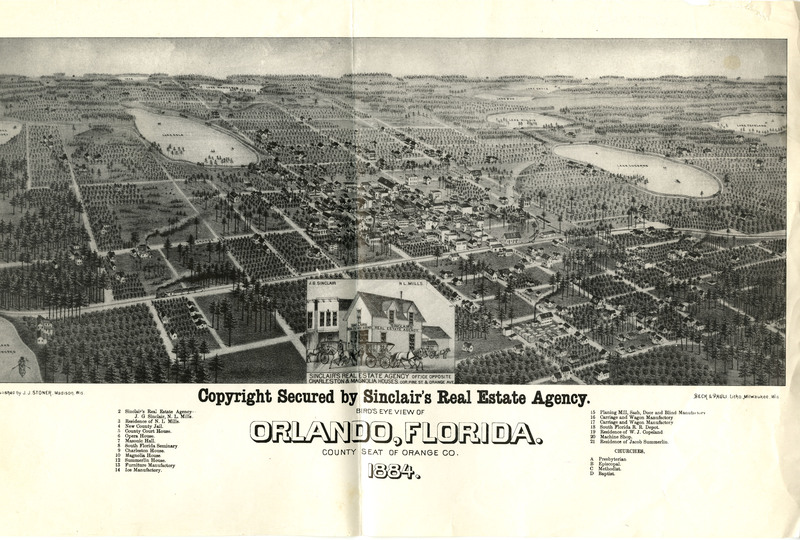 Originally a cattle town, Orlando grew into a major citrus growing center by the 1920s. The city continued to grow during the Great Depression with aid from the Work Progress Administration (WPA). During World War II, Orlando became a major military center as well, with the development of the McCoy Air Force Base and Pinecastle Air Force Base, and with the addition of the Naval Training Center (NTC) Orlando in 1968. Downtown Orlando declined in the 1960s and 1970s. Redevelopment began in the 1970s and continued into the 1980s, with projects such as the Church Street Station entertainment complex. In 1998, a building boom began and continued through the 2000s. Original black and white lithograph by Adam Beck and Clemens J. Pauli, 1884: Private Collection of Texann Ivy Buck. Digital reproduction of original black and white lithograph by Adam Beck and Clemens J. Pauli, 1884. Originally created by Adam Beck and Clemens J. Pauli, and published by J. J. Stoner. There is no known copyright to this resource, which is provided here by RICHES of Central Florida for educational purposes only. 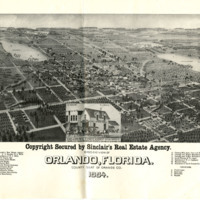 Beck, Adam and Pauli, Clemens J.. “Bird's Eye View of Orlando, 1884.” RICHES of Central Florida accessed April 18, 2019, https://richesmi.cah.ucf.edu/omeka/items/show/7671.